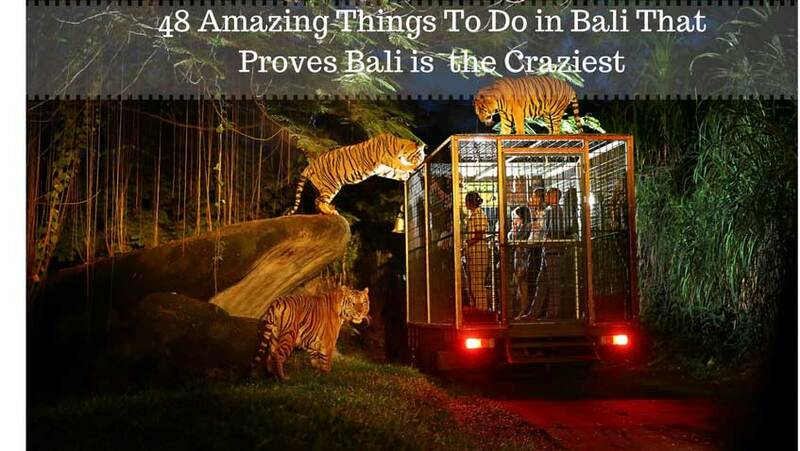 48 Amazing Things To Do in Bali That Proves Bali is the Craziest - Love With Travel - A Travel and Lifestyle Blog. Watch the sunset on the Eiffel Tower – checked. Seakart in Mauritius – checked. What else do you want to fulfill? Though every country has its own specialties you must definitely try before you hit the bucket, did you know that you can actually find dozens of unique attractions just in Bali alone? it’s time to get all geared up and explore our 32 exciting suggestions! Looking for a genuine spa by the sea experience? La Joya is one of the most amazingly located day spas in Jimbaran. Otherwise, head to the mystical riverside Tjampuhan Spa and experience the healing properties of water – through an extraordinary hot/cold spring water jacuzzi created within an elaborately carved mythical stone cavern. From snazzy budget hotels, majestic villas, to the weirdest themes you can think of, one thing’s for sure – a stay in Bali isn’t going to be boring, at least not if you pick the right places. Animal lovers will fall in love with Mara Safari Lodge, where they can live amongst the animals. While barbers once solely existed to make your hair look good, The Sintesa Jimbaran Hotel’s BARber puts the “bar” in the “ber” – literally. Modelled after a 20s-style hidden barber shop (back in the days when the alcohol prohibition forced people to party secretly) – The BARber comes to life with a a classy modern bar with retro tones (where you really can cut your hair) – fitted with everything from a billiard and cigar area to live music. Just like its hotels and villas, Bali also has many interestingly themed restaurants – you name it, you get it. If you have a strong stomach and a lot of guts, Frankenstein’s Laboratory allows you to dine with various monstrous creatures, and even Frankenstein himself. What can be more heart-stopping than dining atop a live volcano? The Madu Sari Mountain Restaurant is located on the edge of a crater on Mount Batur, an active volcano – yes, we’re not kidding! You might be questioning why anyone in their right mind would be in the mood to eat while perched on a volcano, but here’s the catch – you get gorgeous scenery of the beautiful crater-lake Lake Batur (though splattered with residue lava from previous eruptions), and the surroundings are actually romantic enough for a date or two. Food – both local and European – is served as a buffet, with yummy options such as beef stroganoff, fried chicken, and pancakes. It might sound little scary, but it’s completely worth it. All of us have days when we just want to escape from civilisation and enjoy some me-time somewhere. Pomegranate is situated in the middle of stretches of rice paddy fields, while Sardine sits amongst man-made paddy fields that were specially constructed in Petitenget for the ultimate au-naturale experience. There, there’s nothing to bother you – just the occasional firefly or two and greenery that goes on for miles. Feel free to sit back with a cup of fragrant tea, yummy pizza – or a cocktail at Sardine – and think deep thoughts about life, or have a heartfelt conversation with a close friend. Also, the sunset at both establishments are sigh-inducing – life really doesn’t get any better than that. It can be hard to find suitable activities to do when you have a family in tow, but that’s just why we love Bali – for its quirky activities that will keep even the naughtiest kid entertained. Enjoy dance with a twist at the Devdan Show, a one-of-a-kind performance that was partly designed by stage and artistic directors of Cirque du Soleil. Here, modern and traditional elements come together to form a unique 90-minute theatrical and dance tribute to Indonesia – and you don’t even have to leave Bali to experience all of it! Everything from fire to colourful kites appear on the stage, and you won’t have to worry about not understanding what’s going on – as performers communicate the stories via physical signs. Time for some theme park fun! Did you know that Bali has some infinity pools that are lauded as one of the best in the world? If you’re a dreamer, you will fall in love with Munduk Moding Plantation’s “pool among the clouds”. The pool is situated so well that when you lie on its edge, it almost feels as if you are lying amongst the clouds! Alila Uluwatu also has a great cliff-side infinity pool that showcases a gorgeous panoramic view of the ocean. Imagine a day set aside just for lounging in or beside the pool – how can you miss that? Imagine sipping a cocktail on a floating platform in water, or get yourself more tipsy on a bamboo swing in a bar with a beer in hand. Bali has its very own eccentric collection of bars where you can hang out, go crazy and dance the night away. There is even a pub with a gigantic crocodile at the entrance! You can even party in a futuristic yet Gothic-cathedral-styled bar, with trapeze artistes who swing over you while you go high. Yes, honey bears are predators and it sounds crazy to want to hug them, but this impossible feat is actually possible at the Pod Chocolate Factory and Cafe. The factory was set up by Australian Toby Garritt, in pursuit of the way to create the best chocolate in the world. He’s slowly but surely approaching his goal, considering the raving reviews that his chocolates have received. And yes, you get to hug one of the three honey bears that live on the premises after being rescued from hunters. No, you won’t lose your head, and it only costs US$10. As an island, Bali is naturally known for its beach life and activities. But with the influx of tourists, mainstream beaches such as the Kuta beach are already overflowing with people. So if you’re after a bit of peace and quiet, it’s time to head on to Bali’s various hidden beaches that, thankfully, have yet to gain the notice of many. One of our favourite beaches? Nyang Nyang Beach and its white pristine sands that are lined by a towering green cliff, which keeps it away from prying eyes. If you are quite the explorer and looking for some solitude, this secluded beach in Southern Bali is perfect for a little adventure – and some truly beautiful Instagram shots too! There are so many incredible hidden natural attractions in Bali, we don’t know just where to start. From the many hidden waterfalls like Sekumpul Waterfall, to the truly incredible sacred and secret canyon of Sukawati… Any artist, photographer, creative, or simply anyone who wants to be wowed by a real life view of nature’s masterpiece – these are places you have to visit. And for those looking for a little romance, try a picnic at the picturesque Bukit Asah Bugbug! It is the perfect setting for a picnic perfect for catching the sunrise – and panoramic views of the Indian Ocean, its coral reefs and small islands. If you’re looking for something that’s even more spectacular, head to Pinggan Village for the most heartstopping view of Mount Batur’s volcanic landscape. Pro tip: Batur is at its most photogenic at sunrise and sunset, and even makes for impressive night photography – with the lights of Pinggan village spread out at the foot of the mountain, and a sky full of stars twinkling above the peak. Our mothers have always told us to cherish the rice in our bowls, because of the immense effort it takes to plant and harvest them. But have you ever truly understood what goes behind each miniscule grain of rice? Now, you can – by being a rice farmer for a day! You can sign up for the complete rice farmer experience, from a scenic meal amongst rice paddies, planting seeds to transplanting little shoots. After your hard work, you’ll even get to try out the traditional Balinese bathing ritual and lay back for a soothing massage. If you’ve got a rice-hating child, now’s the time to drum the love of grains into their minds! Have you ever marvelled at the smooth beauty of pearls and wondered how your grandma’s favourite pearl necklace was made? At the Atlas Pearl Farm in Pemuteran, you can watch the whole pearl farming process, from the seeding of a pearl to achieve a certain shape and harvesting, to the evaluation and pricing of each pearl. After this trip, no one’s going to be able to hoodwink you with manmade pearls ever again. When the Balinese culture is so chock-full of its own phantoms and spooks, how can you possibly curb the desire to explore its secrets? If you’re a budding paranormal investigator or an amateur ghost buster, a trip to Bali’s various abandoned placesshould surely not be missed. Check out this abandoned plane wedged in between houses in the small town of Kuta. Or these infamous spooky areas such as the defunct amusement park Taman Festival, which was closed down for inconclusive reasons. If you don’t find what you’re looking for at these places, fear not, for Bali has its own supply of spooky attractions. Drop by the uncompleted hotel, Taman Rekreasi Bedugul, or explore a desolate temple in the Karangasem regency. Who knows, you might stumble across a new place with an untold story during your journey. You’ve seen the intricately carved temples, beautifully constructed villas, and all the architectural wonders that Bali has to offer, but you haven’t seen the most amazing one amongst them yet. Located in Nusa Lembongan is a unique underground house hand-dug by a 70-year-old local man, Made Byasa, with nothing but a crowbar. It took him a hefty 15 years to complete the structure, which is just like a fully functioning house above ground – it has bedrooms, a kitchen, and even a sitting area! Are you itching to build your own Gala-Gala house now? Have you always wanted to watch your own jewellery being crafted in front of your very eyes? Not all Balinese food may fit your tastebud, but it’s doubtless that this tiny island houses some of the greatest food out there, and its tropical dishes are increasingly popular. And since you’re visiting, why not add some of these exotic dishes to your cooking repertoire? You can sign up for cooking classes with Bumbu Bali, an award-winning Balinese restaurant and cooking school. Classes are helmed by Heinz von Holzen, a famed chef and cookbook author. You’ll be introduced to the exotic history behind traditional Balinese dishes, shop for ingredients yourself, and even get to make popular dishes such as fried rice, grilled chicken and lamb stew. By the time the lesson is over, you’ll be able to return to your home country with your Balinese Master Chef certificate. Now’s the chance to show your kid that you really are Superman. The newest watersport out there, flyboarding, has made flying a reality for man – by wearing boots connected to a board, which is then connected to a water hose, you can be propelled to as high as 15 metres! Have you ever looked at an elephant and imagined yourself with one of those gentle giants as your friend and pet? At the Bali Zoo, you can actually come close to fulfilling your fantasy – make some precious memories with an elephant friend of your own! The zoo’s Mahout (person who cares for an elephant) for a Day programme offers visitors the chance to learn how to command, care and play with their resident elephants. Other than a whole day’s time to feed, bathe and go for swims with your giant friend, you’ll also get to interact with other zoo animals such as the lions, crocodiles and pythons. So if you’re out to make everlasting memories, this is the place to do it – an elephant never forgets. A Bali trip can’t be complete without going on a trek to discover the secrets that lie within the island’s natural environment. But have you ever tried to trek in the dark? If you’re game for shedding your fear of the dark and the creatures that live in it, sign up for a night tour with Bali Reptile Rescue, a volunteer group that specialises in the removal and rescue of reptiles. The tour, which starts early evening and ends at 1am, includes an introduction to all the reptiles that have been rescued, and a trek that leads you into many unknown night creatures reside. Who knows what you’ll find in the dark? Did you know that high-end brands such as Yves Saint Laurent use Indonesian essences in their perfumes? Yes, those are what makes you smell like a flower all day long. We’ve all had trouble finding the perfect scent for ourselves – some are too flowery, buttery, others are simply a turn-off – but you will never have to worry about that again, for you can create your own scent right here in Bali! L’atelier Parfums et Creations offer 90-minute and 3-hour long workshops that will teach you how to create your own unique scent, and you’ll get to bring back a diploma and 30ml bottle of your very own perfume. You might still not be Victoria or David Beckham, but we reckon having your own perfume will make you feel one step closer to becoming a star. Even if you’re not an outdoors person and walking amongst fish isn’t really your cup of tea, surely you can’t refuse the idea of observing them from the absolute safety of a ship. Better yet, in a submarine. While riding a submarine used to be a pipe dream for normal folks (unless you’re in the Navy), it’s now possible to enjoy underwater life from within the Odyssey, an air-conditioned submarine that can take as many as 36 people to a depth as great as 150 feet. The submarine will take you on a 45-minute trip, setting off from Amuk Bay and diving into the colourful world of coral reefs and underwater life. Now you’ll be able to have your cake and eat it too – enjoying the life of a sporty kid without having to give up on your comfort. No more peering at dolphins through the glass at aquariums; at Lovina, you’ll get the chance to watch this lovely creature roam free in the deep blue sea. Take an early morning boat ride and get a rush of happiness rush watching dolphins dancing along the waves, and a splendid morning view. Enjoy the glistening of the first sunrays on the glassy blue waters and also try some fish feeding while you’re at it. Make sure you reach the spot before 6am. and buy your watching ticket at $5. But losing a little sleep over this spectacular encounter with the wild is more than worth it! While we’re at the topic of mountains, we can’t miss what is probably the most well-known mountain in Bali: Mount Agung. It’s the 5th tallest volcano in Indonesia, and the tallest mountain in Bali itself. Although it’s an active volcano, its last eruption occurred in 1964. Tourists often hike up the 3000-metre tall mountain for an unrivalled bird’s eye view of Bali, while the local Balinese consider the trek a pilgrimage, and most do it at least once in their lifetime. Whether you’re here just for the view or a more holy purpose, this is one hiking trip you definitely have to take in Bali. Before kimchi, there was seaweed. Haven’t you wondered about the origins of your favourite Tao Kae Noi seaweed snack? If you decide to go for a bike ride in Lembongan, be sure to look out for the seaweed farm, where you can observe the rare sight of the local farmers caring for their crops and heaps and heaps of seaweed laid out to dry. You’ll even get to take a boat ride through the mangroves into the seaweed farm itself! The awesome taste of freshly harvested seaweed certainly can’t be found anywhere else. Although Nusa Lembongan houses the largest seaweed farm in Bali, if you want to stay on the main island and get a taste seaweed farming as well, you can head on to Nusa Dua’s Geger Beach, a hidden beach paradise in Bali. The plants are actually harvested to produce cosmetics too! Craving for some mud fights? And no, this isn’t just for kids! Mepantigan is one of the Balinese cultural games you can play in the rice fields, and get very dirty and muddy. Other traditional local games you can enjoy include Eel/frog Catching, Mud Horse Riding, Love and kiss duck, Mud Tug of War, Mud Pillow Fight, Kecak Body Painting, Mud Gamelan and dance, and Massage in the mud. Have we tempted your inner child enough? If you’re suffering from some illness or simply want to refresh your body a little, a trip to the balian’s (a Balinese healer) is definitely in order. Where else but in Bali can you improve your health through ancient magic? Most hotels have recommendations for local balians. A consultation with a balian will easily reveal the problems with your health, after which suggestions for purification and balancing will be given to you, such as holy baths and meditations. Do keep an open mind, though, if you’re planning to go for some traditional healing – some of the practices, such as spitting and body painting, might come across as weird. Recommendations: If you’re interested in getting the Eat, Pray, Love experience, you can pay a visit to Ketut Liyer, the popular healer from the book, in Ubud. Just make sure you arrive early and have more money to spare, as Ketut Liyer only sees 25 people per day and charges a higher consultation fee than most balians. Or you can request for your hotel to make an appointment with a Bali for you. There are certain rules that visitors have to abide by, such as not passing money to the balian directly, so it’s probably better to read up a little before making the trip! Prices usually wavers between US$8 – US$15, unless you need more complicated treatment. Have you been to Bali so many times that you’ve already done almost everything? Before you check off Bali on your “to go” list, make sure you explore the exotic islands surrounding it first! A short distance away from Bali lie the more secluded islands of Nusa Lembongan, Nusa Ceningan, Nusa Penida, Gili Meno, Gili Gede and the Menjangan islands. These islands offer a much more laidback lifestyle than Bali, and offer activities and attractions such as mangrove forests, turtle freeing, snorkelling and others – all without the hassle of fighting with the crowd. Luwak coffee is the most expensive coffee in the world and you can find it only in bali. Hi! I'm at work surfing around your blog from my new iphone 4! Just wanted to say I love reading through your blog and look forward to all your posts! Carry on the superb work! mIDkQe Your style is so unique in comparison to other folks I ave read stuff from. I appreciate you for posting when you have the opportunity, Guess I will just bookmark this blog. "Good day! This is my first comment here so I just wanted to give a quick shout out and tell you I really enjoy reading your blog posts. Can you recommend any other blogs/websites/forums that go over the same topics? Thanks a ton!"